The eco lodge is just off highway 6 the main, asphalt, road from Addis to Awassa. It’s easily accessible from Addis Ababa, making an ideal weekend escape from the city. On one of the main roads to Southern Ethiopia it also makes a great stopping point for those heading south from Addis or returning to Addis. If you don’t have your own transport we can arrange for transfers, to pick you up from or drop you off at Addis Ababa airport, Awassa or anywhere else in the area. Just get in touch with us and we’d be happy to help you. A boat transfer from Kakaroo to the lodge is available for $17.50 pp (single person supplement may apply). 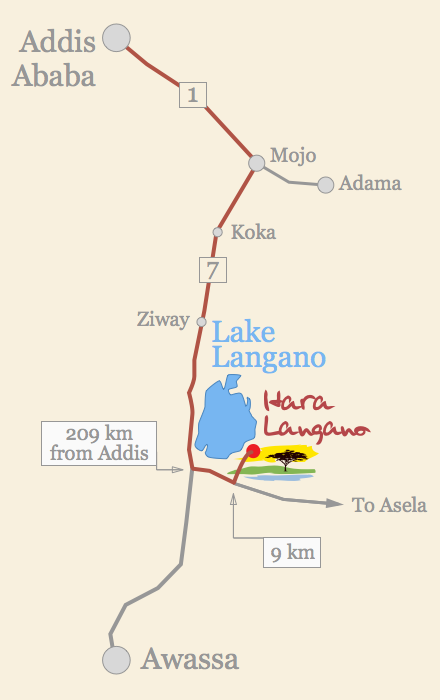 Minibus transfers from Addis to Hara Langano are available for $50 pp (discount for groups). From Addis, travel south through Ziway and Bulbula to the ‘209km from Addis’ road marker. Turn east (left) along the red road for 9kms, crossing three bridges and arriving at a small customs barrier. Just after the barrier, turn left along another good red topped road (new!) for 4km passing over a bridge and after a further 2km the Lodge entrance will be seen on your left.